I think I’m getting in the mood for Thanksgiving already, perhaps because the Canadians celebrated Thanksgiving earlier this month, and it’s one of my favorite holidays. The lack of commercialism, the focus on family and great food, the chance to hang out together, the excuse to overeat (although now that I’m pregnant, I find excuses to overeat all the time! ), and just a general attitude of thankfulness that you find everywhere this time of year, makes this holiday my favorite by far. Christmas is great, when the focus is on the actual holiday and not gift-buying or gift-giving, but Thanksgiving…hmm. There’s just something special about it. So when fresh cranberries showed up in the produce department at my local Fred Meyers, I was excited. No more dried cranberries in my scones! I can stock up, buying multiple packages and freezing them until I want to use them! (A fact I didn’t take advantage of much last year, to my chagrin.) So far, I’ve restrained myself, only buying one package. But let me at them next week… I’m already regretting that mere one-package purchase. 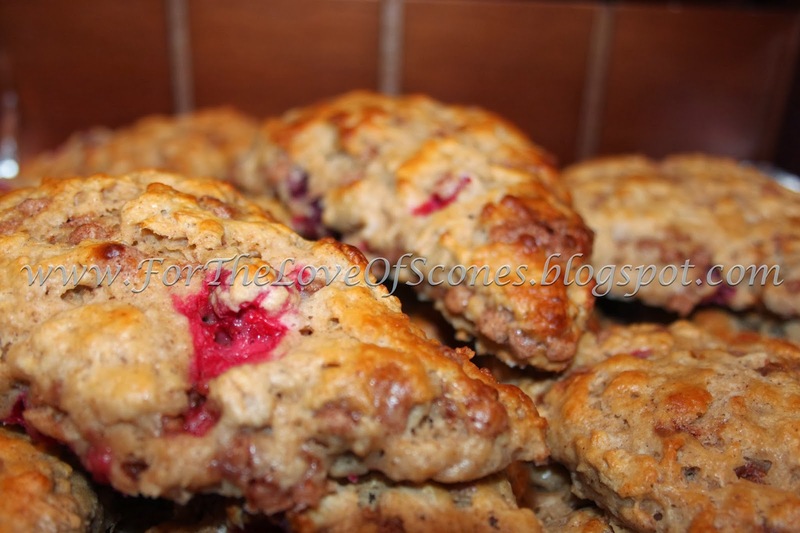 Due to the sudden supply of fresh cranberries, I began dreaming of ways to include them in my scones. Something sweet, but with that tang of tart cranberries, was exactly what I wanted. 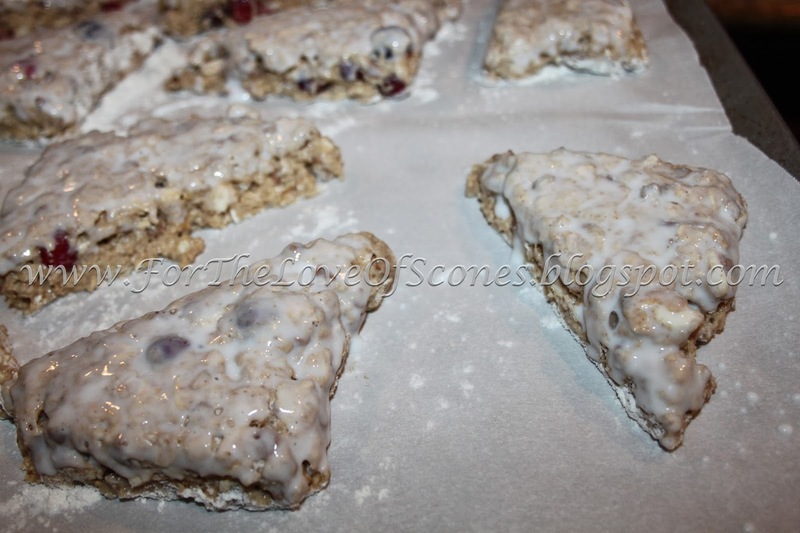 I set out just to make an oatmeal cranberry scone recipe, but then I thought “Thanksgiving,” and “cinnamon.” What two flavors could be more Thanksgivingy? (Well, besides the obvious pumpkin and cinnamon?) 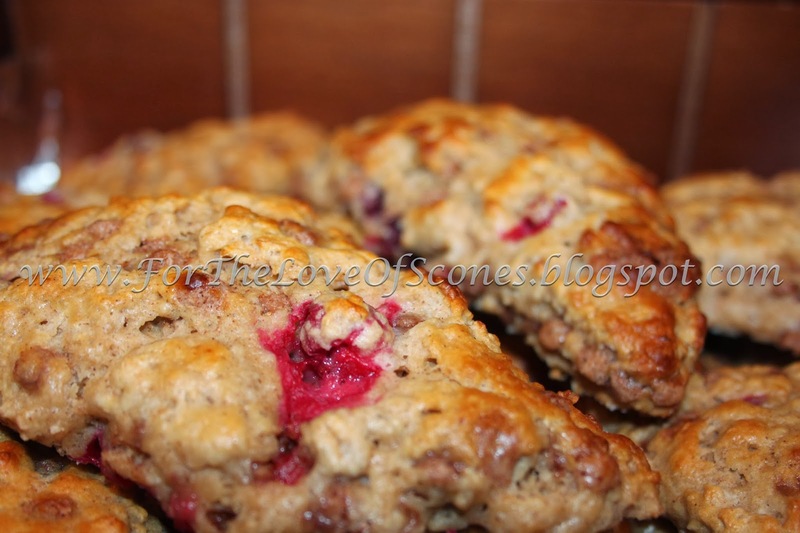 I decided throwing cinnamon chips into the cranberry oatmeal scones was exactly what this recipe needed. And as soon as I ate one, knowing I would send the entire recipe off to hubby’s workplace for them to indulge upon, I knew it would be a recipe I would soon be repeating. Perhaps a new holiday tradition. Only problem is, I now need to figure out how to make them dairy-free. That will be my next challenge! Dairy-free scones for a dear friend who always joins us each Thanksgiving. 1. 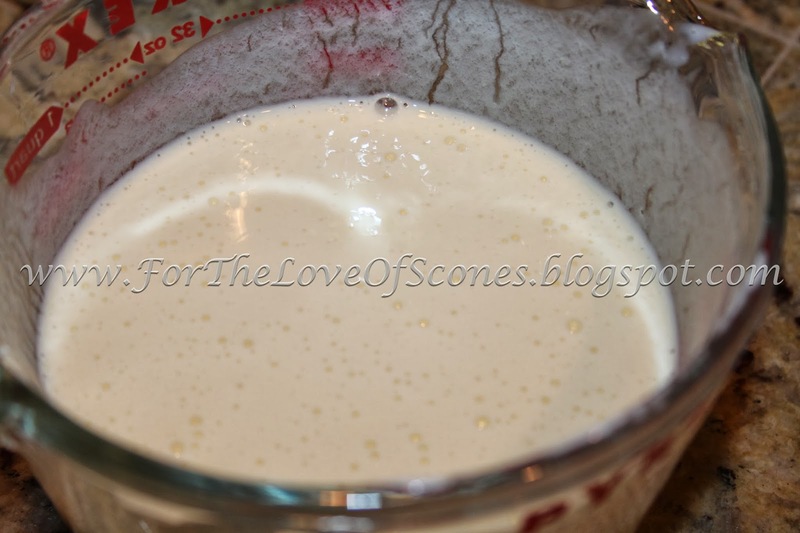 Mix buttermilk, yogurt, eggs together and set aside. 2. Combine flour, baking powder, salt, brown sugar, cinnamon, and nutmeg in a large bowl and whisk to combine well. 3. 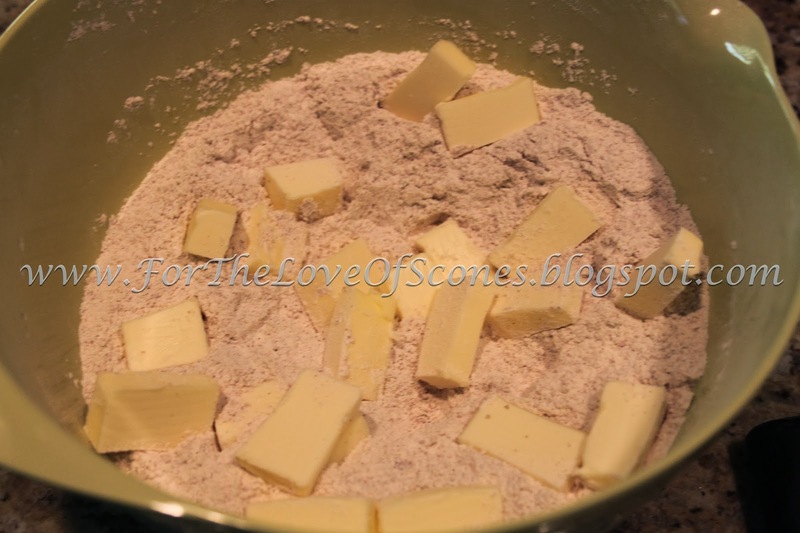 Add cold, chopped butter to the dry ingredients and, using a pastry blender, blend until the mixture resembles coarse sand. 4. 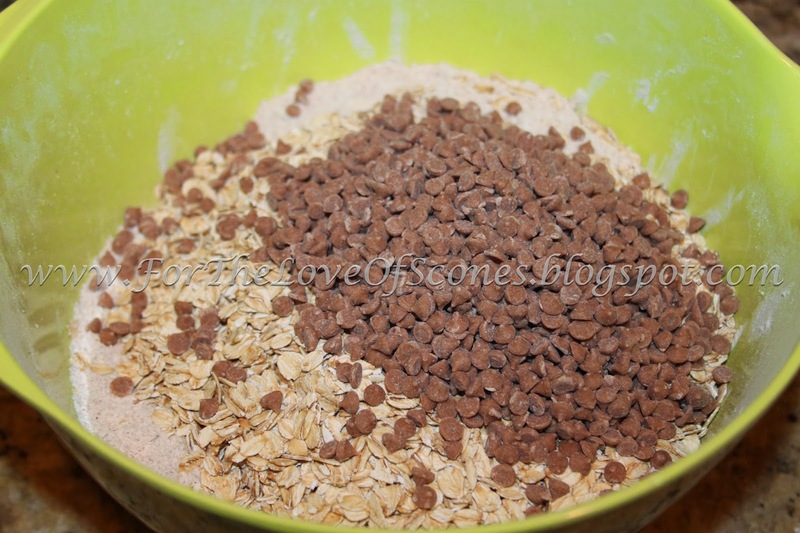 Add the oatmeal and cinnamon chips and mix with a wooden spoon. 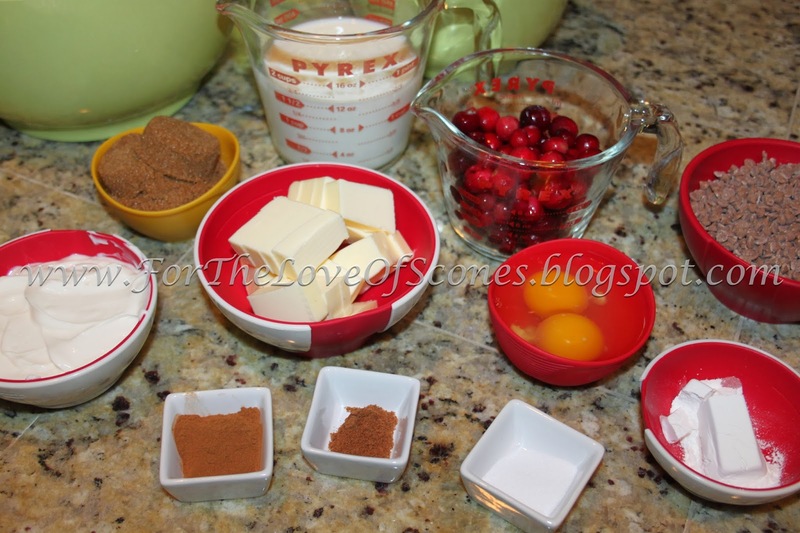 Add the cranberries (you can cut them up if you like) and mix well. 5. Add the liquid to the dry mixture 1/3 at a time, until the dough just comes together. You may not need all the liquid (or you may need a touch more milk). It’s best if the dough barely comes together and is not too sticky. 6. Lightly dust a countertop and turn the dough out. 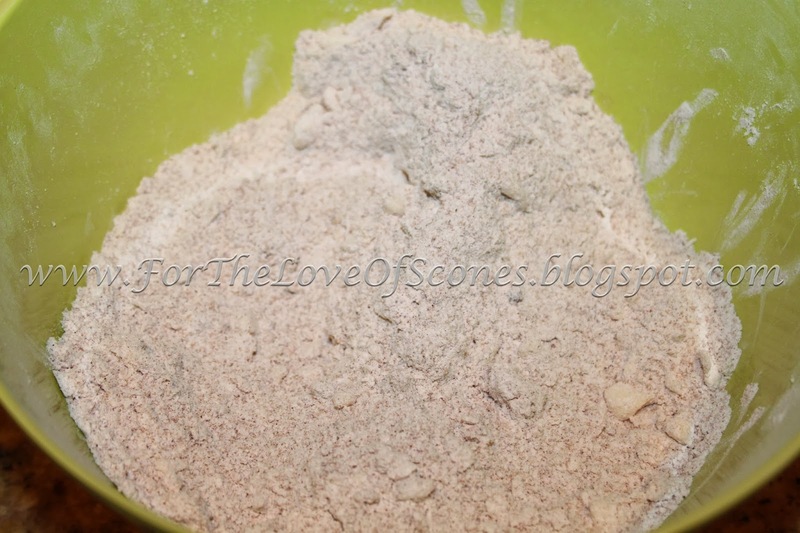 If needed, give it a knead or two to bring together any floury bits. Flatten into a long, wide log, two scones in width and about five scones in length. Cut the dough into 20 scones with a sharp knife. 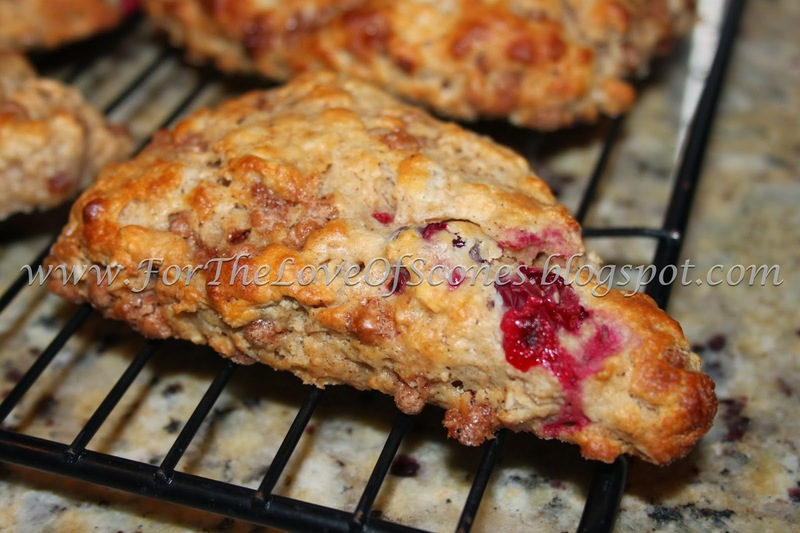 *My test batch of scones spread out a lot more than I expected, but reacted better after I chilled the raw dough in the freezer for about 10 minutes. Alternatively, reducing the amount of butter would help prevent the dough from spreading in the oven. 7. Transfer the scones to a parchment-lined baking sheet, with a couple of inches between each scone. Brush the tops with extra buttermilk (optional), and place in oven at 450F for 15-18 minutes, or until dark gold on top. 8. Remove and let cool. Enjoy warm or cool. Mix the dry ingredients, then add the chopped butter and mix well. Combine the yogurt, buttermilk, and eggs, whisk lightly and set aside. A few pea-sized chunks of butter are okay. 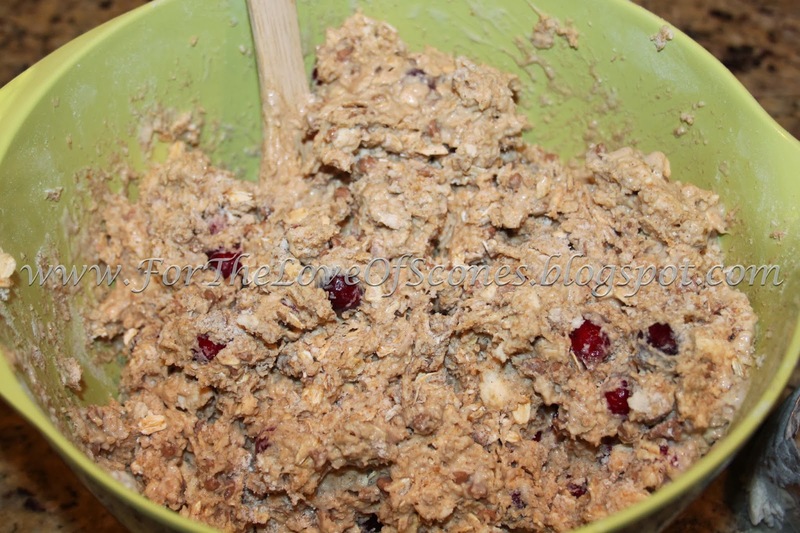 Add the oatmeal and cinnamon chips. Mix with a wooden spoon. 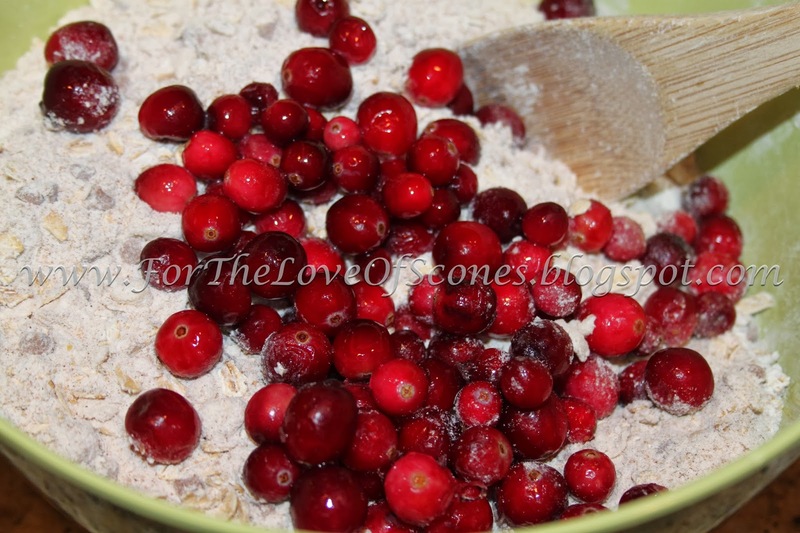 Add the cranberries (you can cut them into smaller pieces if you like). Toss all the ingredients so it’s mixed evenly. Add the liquid in stages so that you don’t add too much liquid. 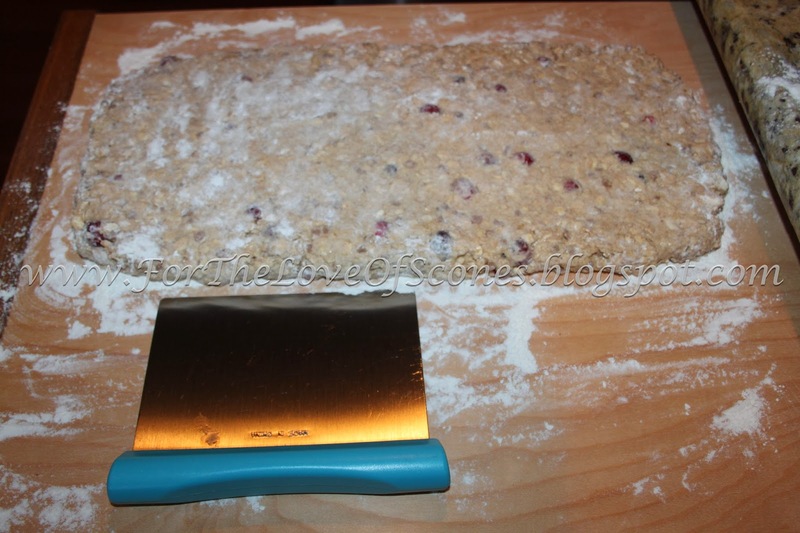 Flatten the dough out on a lightly floured countertop. This is a double recipe, so my dough is two scones wide by five squares. 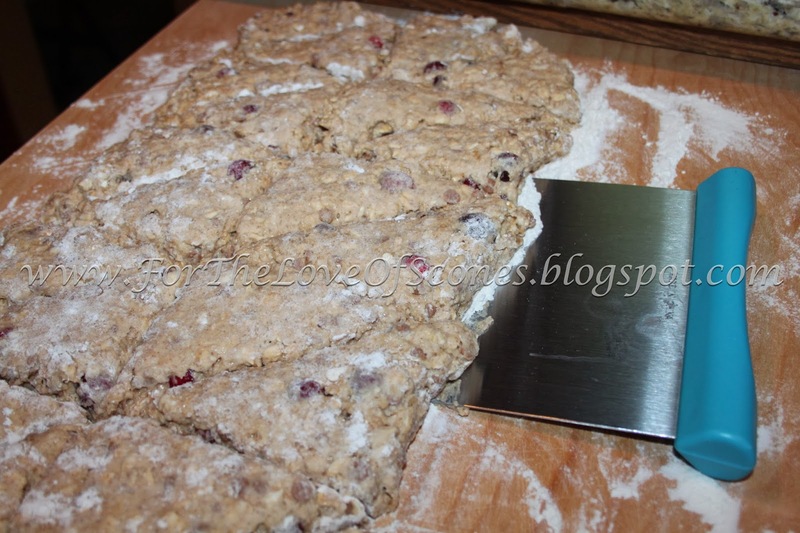 Using a bench scraper or a sharp knife, cut into squares, then cut each square in half to form scones. I got 20 scones out of this dough. These looked fine before I put them in the oven, brushed with extra buttermilk. They spread out a bit in the oven, so make sure they have plenty of room. But yum! These were great! Let’s just say, I wished I’d held some scones back instead of sending them all into work with my hubby… I taste-tested one the night before, and the next morning, I wanted another. 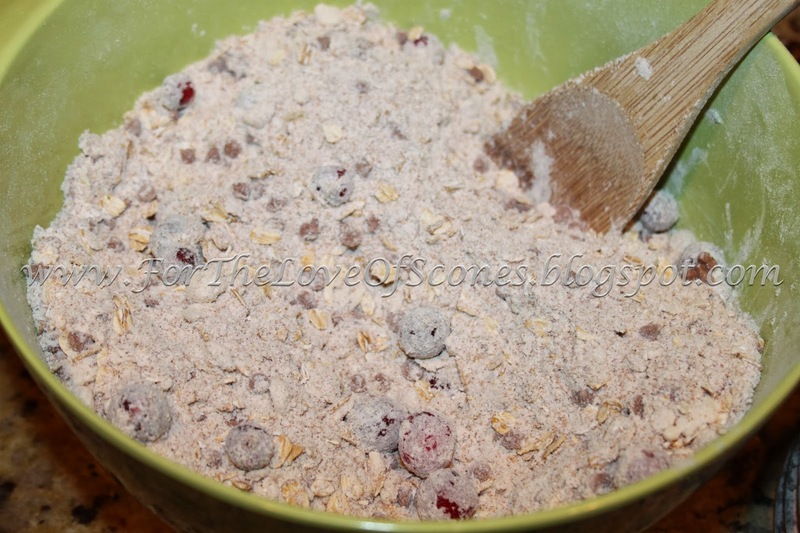 The cinnamon complements the cranberry tang just right, and the oatmeal makes them a bit more breakfasty and less sweet than expected. I really enjoyed these. They would be a recipe I’d make again, although I’d probably reduce either the liquid or the amount of butter I used.